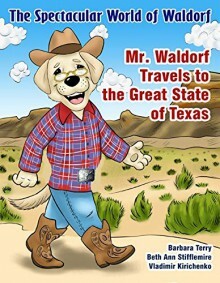 Description: On this adventure, Mr. Waldorf discovers the Great State of Texas. The curious canine encounters fun new friends and places while exploring the vast state visiting the Alamo, riding a bull for 8 seconds, making new friends in Dallas, exploring Austin and more. Children will fall in love with Mr. Waldorf and they will also discover the world in a fun & exciting way. Mr. Waldorf invites you to join his “Whoofishly” fun adventures! Where will the fuzzy canine end up next? This is a great book for young readers. This is good for parents to help struggling readers with this book. It teaches about the places around the USA and the World. The pictures are done wonderfully. The author will get readers engaged with this set of book. I got the 4 books that's are out for this series. This is good for adventurous children. The pup in the book whose name is Mr. Waldorf seem to lose this reading glasses. Your children will laugh and learn at the same time. To me the age is good for children as young as age 3 to beginner readers. Beth Ann is a wife, mother, blogger and book lover from Texas. Her passion is writing stories that draw a reader into a world where they can become the characters and experience a gamut of emotions. When she's not writing, she love's to be home with her family and two yellow labs. In addition she's a sucker for super sappy romance movies, loves trying out Texas wines, is an avid hot tea drinker and enjoys checking items off of her ever-growing bucket list. She has numerous book projects on the horizon including Fiction Romance in both Contemporary and New Adult. Congrats! You read 90 books of your goal of 50!